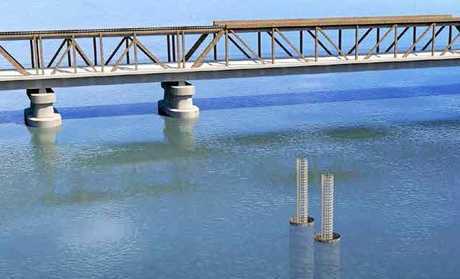 BY MID-2017 Grafton residents will see the first pylons for the new Grafton Bridge in the Clarence River. Work on the $240 million new bridge is ramping up, and Roads and Maritime Services Pacific Highway Program general manager Bob Higgins said there had been increased activity in and around Grafton as the construction of the bridge reaches "the pointy end". "We've got the design done, we've got the preparation works done, which gives our project team and contract workers a clear run at the river," Mr Higgins said. "There is some work on the two approaches that is being done as well, so they will get through that work and start to drive pylons and substructures so people will really see some activity being done there mid-year." Mr Higgins said work to re-level the existing levee system at a number of locations along the Clarence River was about 25% complete. "There is a lot of levee work going on, and soon people will see some earthworks starting on the two bridge approaches," Mr Higgins said. "The key thing that around the midyear, once these earthworks are done, that's when we will start to see work in the river, and that's when things will really start to happen."